Cataract removal surgery is a very common type of surgery and one that can reform the lives of patients. Cataracts occur as a part of the eye called the lens becomes cloudy, this can disturb vision and often cause significant visual loss as the cataract develops. They are extremely common especially in the older generations and used to be difficult to remove, but thanks to huge developments in surgery and optometry, there are many surgeons specialised in their removal. Unlike the old days when cataracts had to be quite bad before a surgeon would consider operating, modern medicine allows us the option of contemplating surgery as soon as the cataract begins to disturb the vision or interfere with everyday life.It is most often performed as an out-patient procedure and does not take very long to perform. The surgery is performed with the aid of very powerful and very expensive microscopes allowing the surgeon to see exactly what they are doing. Many very fine and delicate instruments are used to aid the doctor who will remove the damaged lens and replace it with a clear prosthetic implant depending on the patients needs. The anaesthetic will be administered shortly before the operation is commenced and the level of anaesthesia will be checked prior to the operation starting. Before the surgery consideration must be given to any of the risks associated with the procedure. It is also advised that the patient prepare themselves for the anaesthetic which will almost definitely be under local anaesthetic, possibly with the use of some sedation to help the patient relax. During the procedure the patient must remain very still whilst the surgeon performs the delicate surgery. If the patient feel s the need to cough, speak or communicate in any way, a hand held device indicating this is often given to the patient, allowing the surgeon a chance to stop what they are doing to allow the patient to converse. The anaesthetic will begin to work almost immediately and no pain or discomfort should be experienced during the procedure. The patient may feel movements and be aware of their surrounding but none of the workings of the operation will be felt.If you have any concerns about mobility or concerns about being abler to lay still for the procedure, these should be discussed before the day of the operation so that adequate provisions can be made. Most patients begin to experience the beneficial effects of the operation immediately and some degree of result can be seen at this time also, although the eye will normally be protected from sunlight using gauze and an eye patch which should be worn for the first few hours after the surgery. It may take a few months before normal vision has been restored as the eye heals. Any prescription lenses or contact lenses will probably need amending after the surgery, and an eye examination will be needed to be carried out after the healing process has ended. 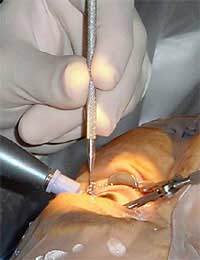 Cataract removal surgery is a very safe and effective way of restoring and carries very few risks. It is a relatively quick procedure and can drastically improve a persons quality of life and ability to continue to work.